The Afghan Taliban claimed inflicting casualties among American soldiers in a rocket strike on a military base in Pul-e Alam, the provincial capital of Logar. In an update to its prior reports on two suicide bombings three hours apart in Helmand province, the Afghan Taliban provided details on the operations and claimed inflicting dozens of casualties among Afghan military and intelligence personnel. The Islamic State’s (IS) ‘Amaq News Agency reported that IS fighters carried out an immersive attack on a military academy in Kabul, Afghanistan. The Islamic State's (IS) 'Amaq News Agency reported at least 220 casualties in a suicide bombing followed by three explosive device detonations at the Shi'a Tabayan cultural center in the Afghan capital, Kabul. The Afghan Taliban claimed killing six American soldiers in a suicide bombing on their gathering in Qarabagh district of Kabul. In an update to its prior report on a "tactical explosion" inside Jalalabad International Airport in Nangarhar province, the Afghan Taliban stated that two American military advisors were killed and three others were wounded. 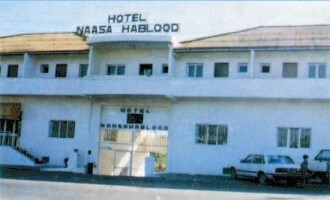 The Shabaab al-Mujahideen Movement, al-Qaeda's (AQ) branch, Somalia, claimed killing 30 government officials, intelligence and security agents, and soldiers, and wounding dozens more in a suicide raid at the Nasa-Hablod Hotel in the capital, Mogadishu. 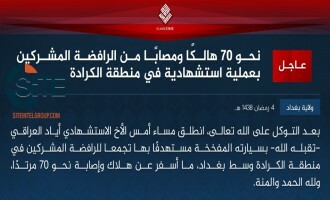 The Islamic State's (IS) Khorasan Province claimed credit for the suicide bombing at a Shi'ite mosque in the capital of Afghanistan, Kabul, killing and wounding 70 people. 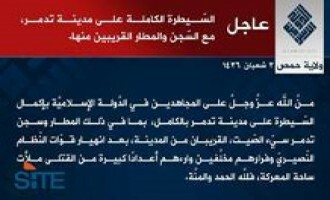 The Islamic State's (IS) 'Amaq News Agency reported an attack on an American base in Shaddadi, located in Hasakah, Syria. After its ‘Amaq News Agency reported its responsibility for the attack in Barcelona, Spain, the Islamic State (IS) issued a formal communique for the operation there and in Cambrils, claiming the killing and wounding of more than 120 “Crusaders” and Jews. The Islamic State (IS) claimed killing and wounding nearly 123 Shi’ites in suicide bombings in Baghdad’s Karrada and Shawaka districts. 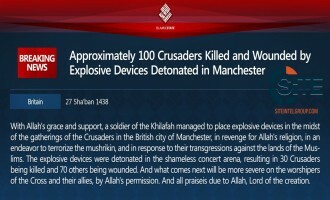 The Islamic State (IS) claimed credit for the bombing at the Manchester Arena in Britain at the conclusion of an Ariana Grande concert, and reported that the act resulted in the killing and wounding of nearly 100 “Crusaders”. 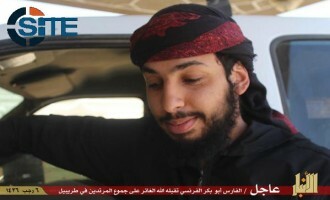 The Islamic State’s (IS) ‘Amaq News Agency reported that the Champs-Élysées shooter is an “Islamic State fighter” and identified him as Belgian. 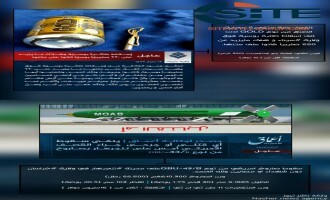 The pro-Islamic State (IS) Nashir News Agency published an infographic ridiculing the cost of the “Massive Ordnance Air Blast” (MOAB) relative not only to its cost, but to the soda can explosive used by the group’s Sinai Province to take down a Russian airliner in October 2015. 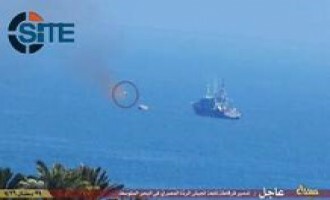 The Uqba bin Nafi Battalion, the Tunisian branch of al-Qaeda in the Islamic Maghreb (AQIM), claimed wounding Tunisian soldiers in an explosion on Mount Ouargha. The Islamic State’s (IS) Sinai Province claimed killing and wounding over 30 Egyptian troops in clashes over the past few days in Arish. 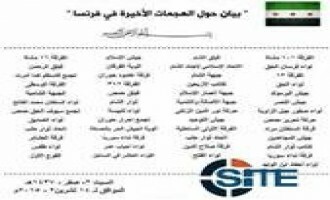 Tahrir al-Sham, the group into which Jabhat Fateh al-Sham and several Syrian militant factions dissolved, claimed credit for the suicide raid at the State and Military Security branches in Homs. 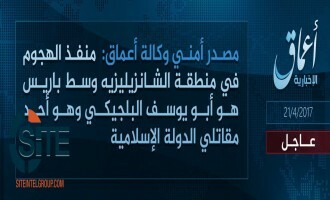 Ninawa Province of the Islamic State (IS) claimed two suicide bombings on Iraqi forces in villages outside Mosul, one of which was carried out by a British fighter. 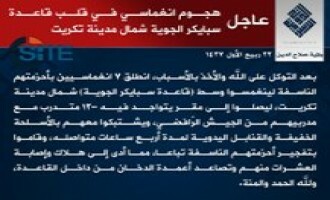 Al-Barakah Province, the division of the Islamic State (IS) for Syria’s al-Hasakah governorate, claimed killing at least 25 PKK elements in a suicide bombing by a French fighter. 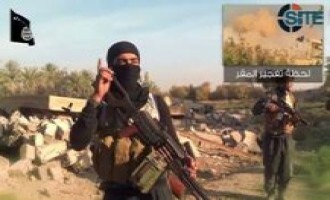 The Islamic State's (IS) Sinai Province claimed thwarting two Egyptian military campaigns in areas of Rafah and Sheikh Zuweid, inflicting deaths and injuries in the enemy ranks in the process. 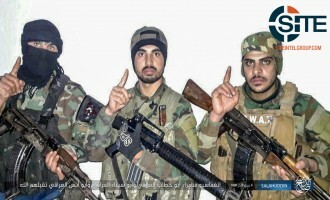 Salah al-Din Province of the Islamic State (IS) claimed killing over 100 Iraqi Federal Police and Shi’ite militiamen in a three-man suicide raid in the city of Samarra. 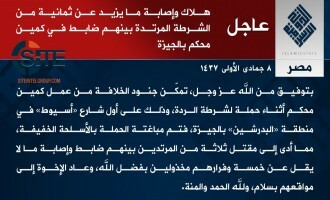 The Islamic State (IS) claimed credit for the attack on foreign nationals and Jordanian security forces in Karak. 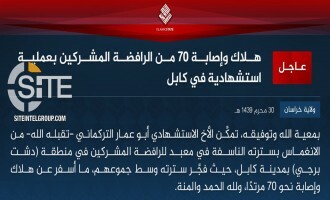 Khorasan Province of the Islamic State (IS) claimed killing 70 and wounding 200 in a dual suicide bombing on a Hazara protest in the Afghan capital, Kabul. 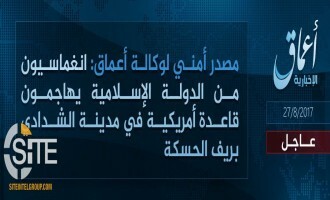 Aden-Abyan Province of the Islamic State (IS) in Yemen claimed killing over 30 Yemeni soldiers in a suicide bombing on a recruitment center in Aden's Khormaskar district, and an explosion that followed. 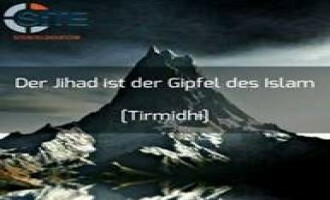 A German-language Telegram account run by an alleged jihadist in Syria offered advice on migrating to jihadi fronts, and assured prospects that entry into Syria remains possible. 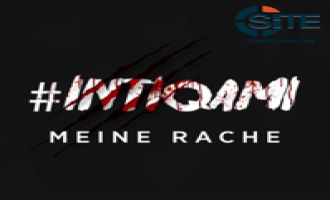 A German-language jihadist Telegram channel demanded more “sacrifice” from Muslims in Germany, and criticized a perceived lack of radical preachers in the country. Baghdad Province of the Islamic State (IS) claimed killing and wounding 40 from the Popular Mobilization in a suicide bombing in Tayaran Square. The Islamic State (IS) claimed killing three Egyptian police and wounding five others in an ambush in Giza. 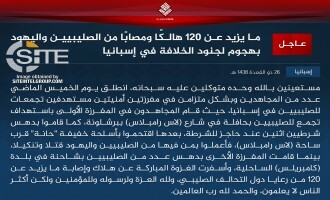 The Islamic State (IS) claimed killing 10 Egyptian police and wounding 20 others, including the head of a local investigations department, in detonating explosives on them in a booby-trapped residence in Giza. 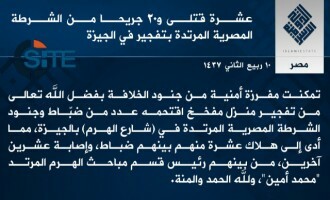 Salah al-Din Province of the Islamic State (IS) in Iraq claimed a seven-man suicide raid on Camp Speicher in Tikrit. 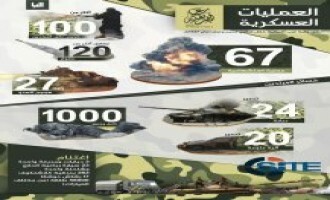 The Islamic State (IS) published an infographic on operations in the last two months by West Africa Province, the IS division formerly known as Boko Haram, claiming more than 100 attacks and 1,000 killed and injured. Syrian opposition groups expressed condemnation after the Islamic State’s (IS) November 13, 2015 Paris attacks, and called for international focus on the Syrian regime and IS as the prime sources of international terror. The Afghan Taliban issued a statement for the fourteenth anniversary of the 9/11 attacks, criticizing the U.S. for using the incident to “intimidate the region and threaten our Islamic homeland with invasion,” and claiming that America has suffered much as a direct result of its military policy abroad. 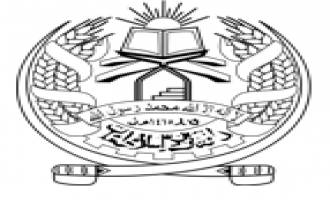 After acknowledging the death of Mullah Muhammad Omar over two years since his passing from illness, the Afghan Taliban announced the appointment of former deputy, Mullah Akhtar Muhammad Mansour, as the new leader, and a Haqqani Network official as a deputy. 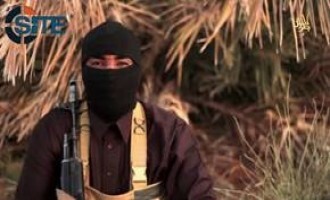 A French-speaking fighter appeared in a video from Hama Province of the Islamic State (IS), threatening that the group will bring “slaughter” to France. 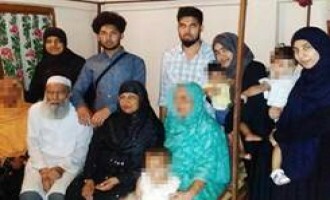 British IS Fighter Distributes Message Attributed to UK Family of 12 on Successfully Immigrating to "Caliphate"
A British Islamic State (IS) fighter and recruiter distributed a message attributed to a UK family of twelve claiming to have successfully immigrated to IS-held territory and exhorting Muslims to join them in the “Caliphate”. The Islamic State (IS) claimed credit for a suicide bombing at the Shi’ite Imam al-Sadiq mosque in Kuwait, and killing and wounding dozens. 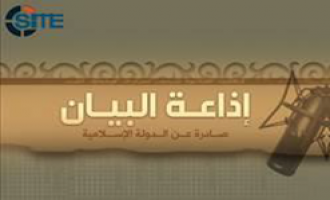 Al-Qaeda in the Arabian Peninsula (AQAP) confirmed reports that its leader, Abu Baseer Nasser al-Wuhayshi was killed in a U.S. drone strike, and that the group’s military commander, Qasm al-Rimi (AKA Abu Hureira al-Sana’ani), is his successor. 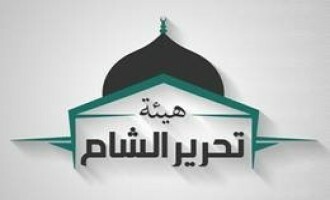 The Nusra Front, al-Qaeda’s branch in Syria, released a statement on the killing of 20 Druze villagers by its fighters in Qalb Lawzah in Idlib governorate, calling it an “unjustified error,” and informing that the perpetrators will be submitted to a Shariah Court and punished accordingly. The Islamic State (IS) released the English edition of its al-Bayan news bulletin for June 14, 2015, reporting on its attacks in Afghanistan, Iraq, Sinai and Syria, including the killing of the Afghan Taliban’s official for Nangarhar province. 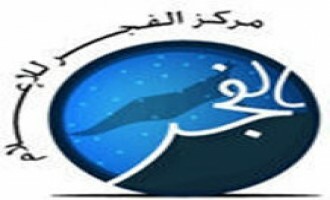 The Mujahideen Shura Council in Derna claimed liberating the neighborhood of Bab Tobruk from the Islamic State (IS) branch in Libya that took it as a stronghold, and advised fighters not to raid the homes of IS members out of interest for innocents. The Afghan Taliban claimed shooting down an attack helicopter in Kunduz province of northern Afghanistan, and specified that its fighters used a KPV 14.5 mm heavy machine gun. Tripoli Province, a division of the Islamic State (IS) in Libya, released a video on a campaign in Sirte it dubbed “The Invasion of Abu Ibrahim al-Misrati,” featuring attacks on Fajr Libya militias, including a suicide bombing by a Sudanese fighter. The Islamic State (IS) released the English edition of its al-Bayan news bulletin for May 21, 2015, reporting on its attacks in Iraq, Libya, and Syria, and announcing its seizing control over the city of Tadmur (Palmyra). The Homs division of the Islamic State (IS) in Syria announced that its fighters have seized full control over the city of Tadmur (Palmyra) and the nearby airport and “notorious” prison. 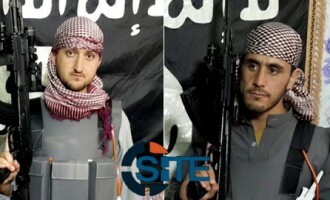 In its al-Bayan news bulletin for May 5, 2015, and subsequent postings by Islamic State (IS)-linked Twitter accounts, the IS claimed credit for the shooting in Garland, Texas, and identified the perpetrators as “two soldiers from the soldiers of the Caliphate”. 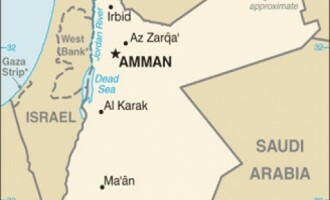 The Baghdad division of the Islamic State (IS) claimed credit for a car bombing in al-Karrada district of the capital, and reported the killing and injuring of more than 60. The Anbar division of the Islamic State (IS) in Iraq claimed suicide bombings by Belgian, French, and Senegalese fighters targeting Iraqi forces at the Trebil border crossing. The Islamic State (IS) released the English edition of its al-Bayan news bulletin for April 26, 2015, reporting on its attacks in Iraq, Libya, Sinai and Syria, including suicide bombings by foreign fighters on Iraq’s borders with Jordan and Saudi Arabia in Anbar, and killing a Nusra Front commander in the east of al-Qalamoun. The Islamic State (IS) released the English edition of its al-Bayan news bulletin for April 19, 2015, reporting on its attacks in Iraq, Libya, Sinai, and Syria, including suicide bombings in Salah al-Din and ar-Raqqah, and shooting down a drone of the “Safawī-crusader coalition” in Kirkuk. The Islamic State (IS) released the English edition of its al-Bayan news bulletin for April 11, 2015, reporting on its attacks in Iraq, Libya, Sinai, and Syria, and covering the “most important” events from the missing April 10th bulletin, including an operation in Tunisia. The Islamic State (IS) has begun issuing its daily al-Bayan Radio news bulletins in English, featuring the English-speaking narrator from its “Flames of War” video, and a corresponding transcript. Just one day after announcing the creation of “al-Jazeera Province” as a new territory under its banner in northern Iraq, the Islamic State (IS) established another “province” in the same region, naming it “Dijla” (Tigris). The Homs provincial division of the Islamic State (IS) in Syria released a video on the two Moroccan fighters who carried out a suicide attack the Furqlus gas plant on December 28, 2014. The “al-Janoub” provincial division of the Islamic State, which is located in southern Iraq, released the second episode in its “Words of Mujahid” series, featuring a fighter describing an area in which the group seized control from Shi’ites. The Islamic State (IS) published a brochure answering hypothetical questions about female slaves and their being taken, their treatment, and possible ways they may be emancipated. The Nigeria-based jihadi group Ansar al-Muslimeen (Ansaru) declared its innocence from the attack on the Central Mosque in Kano, and gave condolences to the victims. 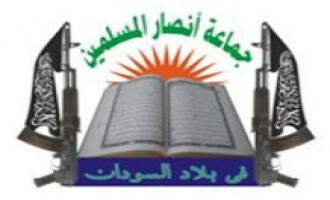 The Kirkuk provincial division of the Islamic State (IS) in Iraq claimed pushing back Peshmerga elements in a raid in Riyadh district, and killing and wounding dozens. 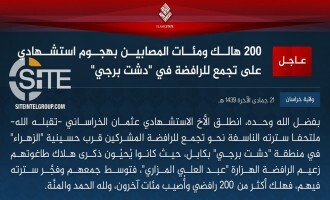 The Baghdad provincial division of the Islamic State (IS) claimed killing over 200 Shi’ites in five car bombings in various area of the province. The Islamic State (IS) claimed killing and wounding more than 100 Shi’ites in two car bombings in Baghdad, one in the area of Sa’doun and the other in Sadr City. The Baghdad provincial division of the Islamic State (IS) claimed killing and wounding dozens of Shi’ite militia elements in a triple car bombing in Baghdad’s al-Dolai neighborhood. 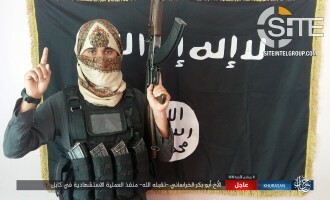 The Baghdad provincial division of the Islamic State (IS) claimed killing and wounding dozens in suicide bombings in Sadr City and al-Kadhimiya on October 13, 2014. 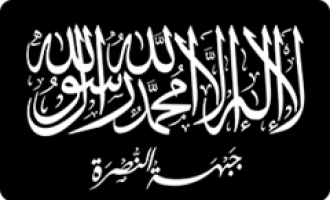 The al-Qaeda in the Islamic Maghreb (AQIM) offered its condolences to the Shabaab al-Mujahideen Movement for the loss of its leader, Mukhtar Abu al-Zubeir (AKA Ahmed Abdi Godane). 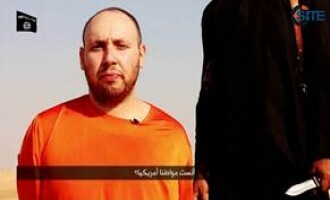 The Islamic State (IS) released a video of beheading American journalist Steven Joel Sotloff and threatening another captive, a Briton, David Cawthorne Haines. 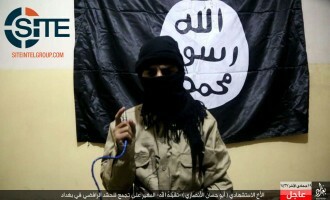 The Islamic State (IS) released a video showing its beheading of an American citizen, James Wright Foley, and its threatening to execute another, Steven Joel Sotloff, if U.S.-authorized military operations against the group continue. 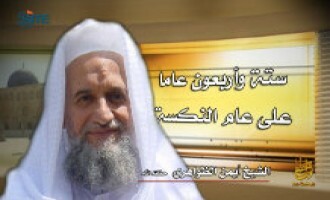 In an unexpected and unprecedented turn of events, al-Qaeda members and jihadists from all over the world who embrace the ideology of global jihad are now doubting the group's leader, Ayman al-Zawahiri, and calling for his removal. 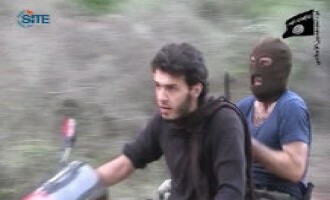 The al-Nusra Front, an al-Qaeda branch in Syria, reported on a joint operation with other jihadi factions to capture al-Kindi hospital in Aleppo, and said that with its success it took a "big step" towards breaking into the central prison. Al-Qaeda in the Arabian Peninsula (AQAP) released a video speech from its military commander, Qasm al-Rimi (AKA Abu Hureira al-Sana'ani), acknowledging the attack at a military hospital in the Yemeni capital, Sana'a', but said a disobedient fighter is responsible. 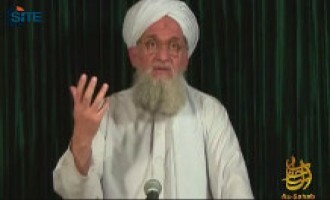 Three days after al-Qaeda chief Ayman al-Zawahiri called for attacks on U.S. interests in response to its military engagements in the Muslim world and its drone strikes in Pakistan and Yemen in particular, the U.S. State Department issued a travel alert about the terror group potentially launching operations in the Middle East and North Africa. Al-Qaeda leader Ayman al-Zawahiri called Muslims everywhere to act against the United States and its allies in order to stop their "crimes," and pledged to free Muslim detainees in Guantanamo and other prisons. 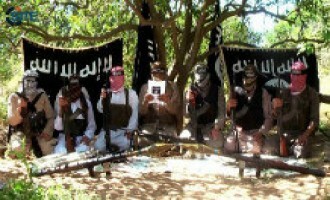 The Shabaab al-Mujahideen Movement claimed an attack on Turkish diplomats in the Somali capital, Mogadishu, and slammed Turkey for being an “invaluable” American ally in its alleged “war on Islam”. 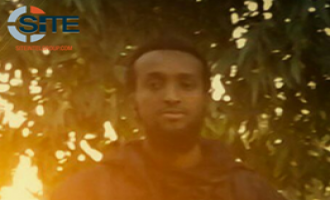 The Shabaab al-Mujahideen Movement pledged to remain strong and united amidst reports of internal conflict and the killing of prominent jihadi officials by order of its leader, Mukhtar Abu al-Zubeir. The Brigades of Abdullah Azzam warned Hezbollah to stop participating alongside the Bashar al-Assad regime in the Syrian revolution or Lebanese Shi'ites will face attacks by Syrian fighters. The Turkistan Islamic Party (TIP) released the second episode in its "Lions of War" video series, inciting Turkish Muslims to participate in jihad and showing mortar and rocket attacks by fighters in the Afghan-Pakistan region. 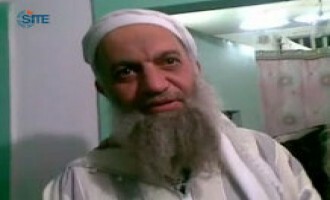 Muhammad al-Zawahiri, the brother of al-Qaeda leader Ayman al-Zawahiri, and fellow prominent Egyptian Salafists Ahmed 'Ashoush and Jalal Abu Fotouh criticized the founding of the Democratic Jihad Party in Egypt and what they see as an attempt to mix the concepts of jihad and democracy. Al-Qaeda's media arm, as-Sahab, released a video focusing on what fighters suffer while participating in jihad, such as pains and difficulty traveling with heavy weapons, traversing dangerous roads, and receiving wounds in battle. 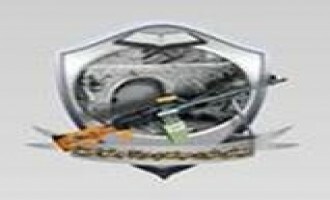 Al-Fajr Media Center, the exclusive online distributor of al-Qaeda's propaganda, chastised jihadists who spread rumors about the Islamic State of Iraq (ISI) and slandered its leadership, and recommended that jihadist forums and media groups not associate with them. 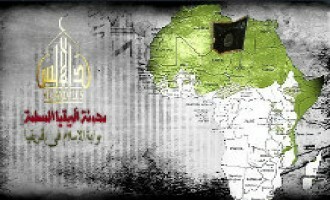 Al-Qaeda in the Islamic Maghreb (AQIM) announced its expanding its online presence with the opening of a new blog, the "Muslim Africa Blog," and social networking accounts on Facebook and Twitter for the new website. 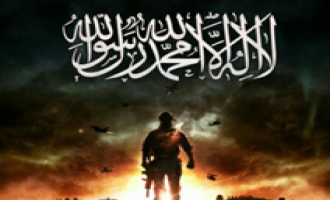 Fighters in the al-Muhajireen Brigade in the Levant called upon Muslims to participate in the Syrian Jihad, and appealing to those who don't wish to fight, explained that merely coming to teach Syrians about their religion is sufficient to fulfill their "duty". 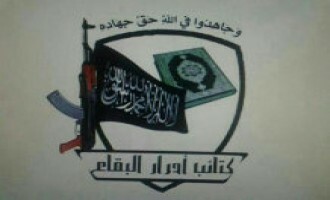 An alleged jihadist group calling itself the "Ahrar al-Beqaa Brigades" issued a statement announcing its establishment, and in it, warned Hezbollah to stop intervening in the Syrian revolution or face attacks. The al-Muhajireen Brigade in the Levant released a video about a fighter slain during a clash with Syrian soldiers in the Jabal al-Turkman mountains in Syria's Latakia governorate, and showing footage of his training and burial. Islamic State of Iraq (ISI) leader Abu Bakr al-Baghdadi announced that the al-Nusra Front is its branch in Syria and that both groups will now be called the “Islamic State in Iraq and the Levant”. 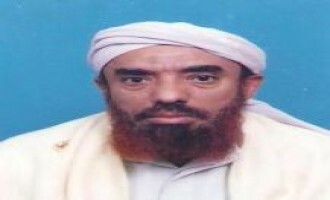 Al-Qaeda in the Islamic Maghreb (AQIM) gave condolences to Yemeni Muslims and al-Qaeda in the Arabian Peninsula (AQAP) in particular for the death of radical Yemeni cleric Awad Ba Nijar, and denied a statement attributed to it about the "true face" of the "Crusader conspiracy" against Muslims. 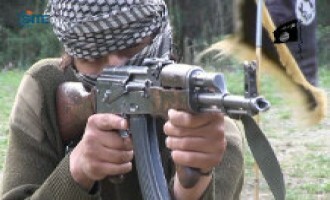 The Afghan Taliban gave an updated report about its seven-man suicide raid in Farah province, claiming that 80 people from among Afghan security elements, judges and court personnel were killed and 75 others were injured. 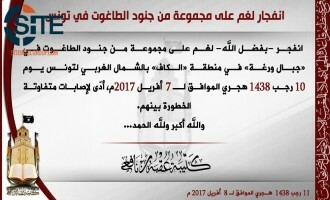 Al-Qaeda in the Islamic Maghreb (AQIM) officially released on jihadist forums its statement announcing the execution of French hostage Philippe Verdon and threatening to kill its remaining French hostages. 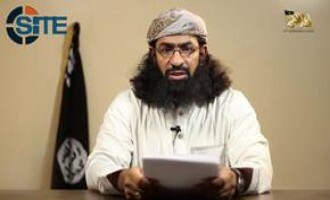 Al-Qaeda in the Arabian Peninsula (AQAP) released a video focusing on Ali bin Saeed bin Jamil (AKA Muwahhid al-Maribi), a commander who served in Abyan, al-Baydha' and Marib provinces of Yemen and was killed in a US airstrike. The Mujahideen Shura Council (MSC) in the Environs of Jerusalem claimed responsibility for the rocket strike on Sderot during US President Barack Obama's visit to Israel. The al-Muhajireen Brigade (Emigrants Brigade) released a video of a Chinese fighter threatening the Chinese government to stop providing aid to the Bashar al-Assad regime or face attacks on its economy. Al-Qaeda in the Islamic Maghreb (AQIM) advised Islamist youths in North Africa and Tunisia in particular to remain in their countries in order to fight secularism, but told the jihadists among them to travel to fight “Crusader France”.